The guest of this week’s Pest of Best article could have easily been renamed “Pest or Pet” due to its unique behavioural patterns. It is also one of the most controversial figures within the pest control world, drawing the ire of farmers, pest controllers and animal rights activists for extremely different reasons; either as crop killing creatures or cute and cuddly critters. We are of course speaking of the rabbit. The question that needs to be answered however, is; why exactly are rabbits classed as pests and do they deserve to be? Rabbits, first and foremost are a popular choice of household pet, according to a survey taken by the PFMA (Pet Food Manufacturers Association) in 2014 with 1.2 million households claiming to have own a rabbit as a household pet. Furthermore, a rabbit is common addition to young families with children; due to their maintenance as household pets, children can benefit from the experience of caring for the creature. However, despite their ‘cute and cuddly’ appeal, rabbits are a widely recognised problem for many (farmers in particular). 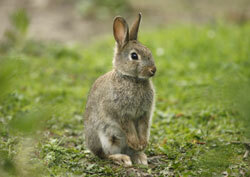 Wild, untrained rabbits can cause major damage to domestic and commercial gardens by eating plants and shrubbery. Farmers have particular issues with wild rabbits as there have been many documented cases of rabbits destroying large amounts of crops within their fields, which is a key attribute to the requirements of rabbit control as pest control service. Additionally, rabbits have the capability to weaken the foundation of roads, fields and gardens as a result of their constant burrowing of not only the single rabbit, but also of their young. Female rabbits have the distinct attribute of producing 5 litters of up to 6-8 young at a single time, which can further lead to dramatic increases in their burrows’ population- providing farmers and homeowners more problems if the rabbit colony is left uncontrolled. There are many arguments for and against rabbits being a member of the pest family due to the potential destructiveness these usually docile creatures could bring to gardens, it is important to remember that not all rabbits can be domesticated household pets which brings the unfortunate requirements of rabbit control.